Government figures released Wednesday showed union membership declined from 11.8 percent to 11.3 percent of the workforce, another blow to a labor movement already stretched thin by battles in Wisconsin, Indiana, Michigan and other states to curb bargaining rights and weaken union clout. Lowest since the 1930s? Maybe it isn’t a coincidence that low union membership rates lead to extremely weak economies. The picture is even worse for the private sector. Union membership peaked in 1953 at 28%. That year, the unemployment rate was 2.5%. Today it’s down to 11.3% and the unemployment rate is 7.8%. So much for the belief that unions kill jobs! What many people forget is that union employees are also consumers. When union membership declines, so do wages. But when wages fall, workers have less disposable income. This leads to lower consumer demand – and consumer demand is ultimately what creates jobs. Many people also forget that no union contract can be forced onto any employer. All unions do is give employees more bargaining power. The father of capitalism, Adam Smith, understood that even when employees are unionized, employers still have the upper hand in negotiations. Unions don’t level the playing field, they just make it less uneven. Given the fact that employers have the upper hand in negotiations – even when employees are unionized – it’s no wonder that corporations are getting everything they want in this low union membership environment; government bailouts, tax payer funded sports arenas, free trade agreements, tax credits, Right-to-Work laws, etc. The result of all this corporate power hasn’t done a thing to create jobs. But it has led to record high profits. 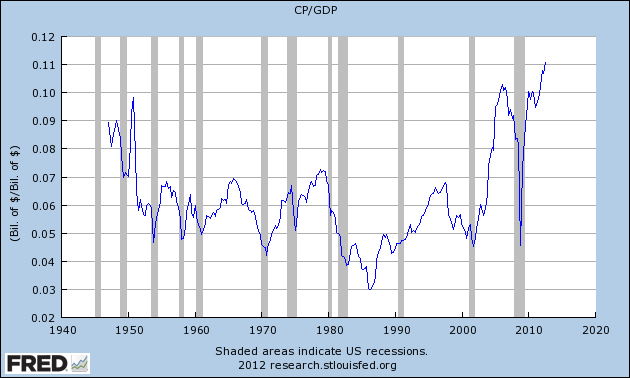 Corporate Profits as a fraction of GDP.